The prior, P(X), will be calculated using a combination of smoothness metrics. The evidence, P(t|X), will be calculated using the known probability distribution of times between appliance cycles. These are explained respectively below. 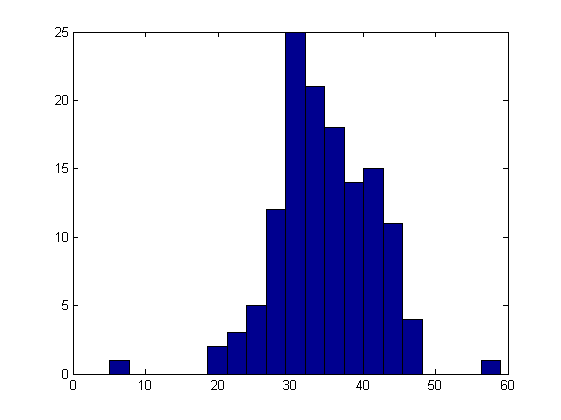 This can be modelled using a normal distribution of mean and standard deviation calculated from this data set. This model will be used to calculate the evidence probability. In both cases, the 1DERIV metric has been used to calculate whether subtracting the appliance signature had smoothed the aggregate power array. A threshold was applied to these smoothness values to produce a list of candidates for which the subtraction increased the smoothness of the array. Next, the candidates were multiplied by a confidence metric. In the first case the 2DERIV metric was used, and in the second case the ENERGYRATIO metric was used. Given a known appliance cycle and a number of candidates for the immediately following cycle, the posterior probability for each candidate cycle was calculated. The maximum likelihood candidate cycle was selected as a correct cycle and the process was repeated sequentially for the remaining cycles. The two plots below show the estimated fridge cycles (blue) against actual fridge cycles (red). Both estimations worked well, correctly detecting 23 and 24 cycles respectively, out of 31 actual cycles. Each method actually only generated 30 positives, of which 7 and 6 were false positives respectively. There was a common interval in which neither approach generated a true or false positive, occurring at a time when the off duration was at a minimum. The use of a model with an off duration that varies over time might increase the performance of both approaches here. In addition, it is interesting to note that there are some areas where approach 1 outperforms approach 2, and other areas where approach 2 outperforms approach 1. This is encouraging, as it could mean that the two approaches are complementary. I investigated using a third approach in which the confidence metric was the product of 2DERIV and ENERGYRATIO, although the result was less accurate than either individual approach.